What is the state of Iran’s economy in 2013 compared to a year ago? Iran's economy enters 2013 significantly worse than a year ago, particularly with higher inflation and unemployment than at the beginning of 2012. The rial also plunged from around 11,000 to the dollar at the beginning of 2012 down to between 22,500 and 31,000 at the beginning of 2013, depending on the type of transaction. The past year was probably the most tumultuous economically for Iran since 1994, when an external debt crisis triggered a serious inflationary shock and a recession. At the outset of 2012, many Iranians expected another economic shock due to the growing array of sanctions on Tehran’s oil sales and financial transactions led by the United States and European Union. In 2013, many now expect the international economic cordon to be further tightened. 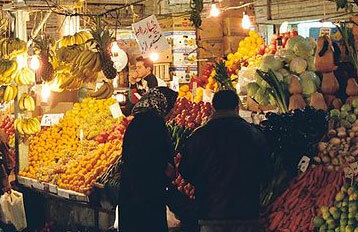 The 2012 squeeze did not produce a hyperinflationary spiral, but annual overall inflation in 2012 was estimated to hit between 40 percent and 60 percent, according to Iran’s business media. Tehran was forced to limit foreign exchange transactions and the export of strategic goods in response to the effect of sanctions on Iran’s currency market. Due to sanctions, Iran's oil exports were also basically cut in half in 2012, from 2.3 million barrels a day at the beginning of 2012 down to around 1 million barrels a day at year’s end, according to the International Energy Agency. The accumulated impact of revenue declines is likely to produce two additional problems in 2013. First, the national budget deficit is expected to increase to around 30 percent of the current budget (in the Persian year ending in March 2013), which means that President Mahmoud Ahmadinejad will be forced next year to cut spending, raise revenue, and prop up state banks with new cash injections. Iran’s parliament wants to put as much control over the government budget as it can, since many members of parliament contend that Ahmadinejad's use of revenue is opaque at best. Second, further changes in subsidies for basic commodities—which date back to hardships during the eight-year Iran-Iraq war in the 1980s—are on hold. Ahmadinejad introduced changes to this subsidy program over 2011-2012, including liberalization of some prices combined with monthly stipends for the entire Iranian population. But he only got through one round of subsidy cuts before Iran’s parliament halted further increases in fuel prices as well as higher stipends. Inflation had whittled away the benefits of both, although the idea is not dead. Iranian economists are divided about subsidy reforms. Some think the subsidy cutbacks generated an inflationary shock at a time that the domestic economy—both the manufacturing and agricultural sectors—were unprepared for higher production and raw material costs that they then either had to absorb or pass along to consumers. So sanctions were not the only driver of inflation in 2012. Other economists are more sanguine about the reforms, given the difficulties of enacting any economic policy changes in Iran. The ill-effects are temporary, they contend, and many other developing countries use stipends as part of their welfare programs. A diplomatic solution about Iran’s controversial nuclear program over the next year, they say, would lessen the pain and other subsidies could then be removed. What is the debate within the government over what to do about the current economic situation? The admission of economic woes by most of Iran’s political class has opened up space for debate over economic policy. Some officials, including the president, now argue that reducing Iran’s reliance on oil revenues, a byproduct of international sanctions, is a blessing in disguise. Private sector representatives in Iran’s Chamber of Commerce counter that they could manage the economy better than the state does. Both claims are seriously exaggerated, but the rival positions reflect the political impact of the deepening economic crisis in a presidential election year. A viable solution may depend less on economic policy than on the outcome of Iran’s negotiations on its nuclear program, several Iranian officials have admitted publicly. Iranian officials are now gearing up for talks with the world’s major powers—the so-called P5+1—from the United States, Britain, China, France, Germany and Russia. Iranian negotiators want sanctions relief in exchange for any concessions limiting its nuclear program. How much influence does the economic situation have on the presidential election due in June 2013? The economy will clearly be one of the main issues in the election. Unlike many developing countries, however, Iran does not have a large external debt. It has a porous, open economy, which helps the country's 79 million people deal with the negative effects of financial sanctions. So the situation is not yet dire. But people may vote for a candidate who they believe can actually get something done in the economic arena. Many candidates will likely run against Ahmadinejad—notably his economic policies—even though he is not allowed to run again under a constitutional limit of two consecutive terms. Across the political spectrum, Ahmadinejad’s administration is now widely associated with failed policies and gross mismanagement. In 2012, most conservative media blasted the president and his staff for Iran’s growing economic woes. Indeed, Iran’s economic policy debate has often served as a cover for political criticism since the 1979 revolution. The 2013 presidential election will almost certainly follow the same pattern, given growing economic woes and the linking of their alleviation with a resolution of the nuclear issue. Kevan Harris, a post-doctoral research associate at Princeton University’s Department of Near Eastern Studies, visited Iran in October 2012. Read Kevan Harris' chapter on the bazaar in "The Iran Primer"
*Photograph of the Tajrish bazaar provided by Wikimedia Commons.